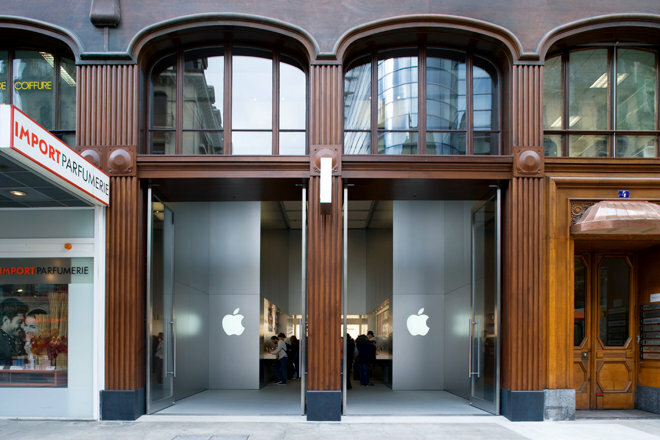 Apple looks set to continue expanding its debt offering program, with the company reportedly planning a new sale of bonds denominated in Swiss francs designed to take advantage of the extremely low yields available in the market. Apple's Rue de Rive store in Geneva. The size and maturity of the offering have yet to be decided, but a 10- to 15-year bond could fetch a yield of less than 0.5 percent, according to the Wall Street Journal. The company has retained Goldman Sachs and Credit Suisse to oversee the deal. A yield below 0.5 percent would be a significant discount even from the exceptionally low rates Apple saw on its euro-denominated offering last November. That sale, which raised $3.5 billion, saw the company pay 1.1 percent on 8-year notes and 1.7 percent on 12-year notes. "Much like in the euro market, we think retail demand for Apple bonds will be strong in the Swiss franc market," UBS credit strategist Thibault Colle told the Journal. This would be Apple's second bond issue of the year. The company raised $6.5 billion last week, with roughly a 2.5 percent yield for 10-year notes and a 3.5 percent yield for 30-year notes. Apple uses debt primarily to finance its $130 billion capital return program, as the cost is substantially less than the tax burden that would be incurred by repatriating some of the more than $140 billion in cash Apple currently holds overseas. The company is expected to announce an update to the capital return program during its quarterly earnings call in April.